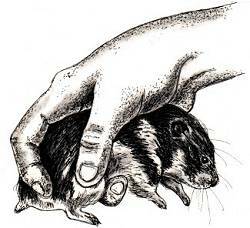 Two-hand hamster method: Gently scoop the hamster into two hands, and bring your hands together beneath the hamster's body. The animal is now fully supported. Slightly cup the tops of your hands inward over the hamster's back to make sure it cannot jump out and fall. One-hand hamster method: This method should be used only on tame hamsters that are accustomed to being handled. 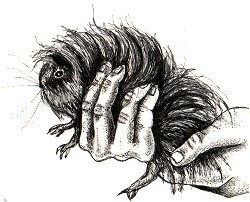 With your fingers toward the hamster's rear end, grasp the hamster securely with your palm along the animal's back. Your middle fingers should support its rump on either side of the tail. Lift gently. You may then transfer the hamster into the palm of your other hand and stroke it as a reward. Guinea pig method: Guinea pigs are larger than hamsters and require more support to protect their backs and internal organs. 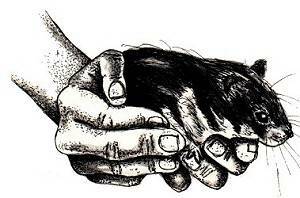 Slide one hand beneath the guinea pig's belly, hold your other hand beneath its rear end and lift. Rabbit method: Most rabbits are larger and heavier than guinea pigs, so they will require extra support. Place one hand beneath the rabbit's chest, just behind the elbows of its front legs. Slide your other hand beneath its rump and hind legs. 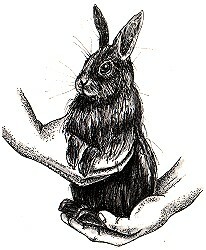 Hold the rabbit gently, but firmly, as you lift to ensure that it does not kick out of your grasp. Remember, never lift a rabbit by its ears. Ears are sensitive hearing organs, not handles.